An armada of microlight planes will fly from Calais to Dover today as France and Britain mark 100 years since aviation pioneer Louis Bleriot became the first man to fly across the Channel. The Frenchman's crossing at daybreak on July 25, 1909, was the culmination of a six-year race to perfect a viable flying machine, that began in 1903 with the first flight by US pioneers Orville and Wilbur Wright. 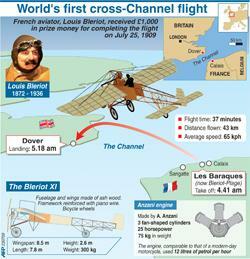 Mr Bleriot's 37-minute flight between Les Barraques near Calais and the Dover cliffs, on a cloth-and-wood monoplane or single-winged aircraft, convinced a sceptical public that aviation had a future. Today, a restored original of his flying machine, the 25-horsepower Bleriot XI, and three replica models will fly across the Channel in a historic recreation of his feat. Some 300 French, British and Belgian pilots are to join the tribute to the aviator, flying in waves over the Channel on board microlight aircraft, seen as the closest modern equivalent to Bleriot's plane. And France and Britain's air display teams will stage a joint fly-past above the cliffs of Dover, where organisers expect a crowd of at least 10,000 to join the weekend of celebrations. "Mr Bleriot's crossing of the Channel was a turning page in aviation history," said his grandson, also named Louis Bleriot, who helped organise the two days of air pageants and fireworks on both sides of the Channel. "Today's aircraft are still handled the same way: a rudder bar under the pilot's feet, and a joystick to control the aircraft's sideways and nose-to-tail position." The spark for Mr Bleriot's crossing came in 1908 when the owner of Britain's Daily Mail, Lord Northcliffe, offered a £1,000 prize for the first person to fly a plane across the English Channel. Three contenders rose to the challenge: a Russian aristocrat, Charles de Lambert, a wealthy British sportsman named Hubert Latham and Louis Bleriot. Lambert dropped out after a series of engine failures while Latham - the favourite to win - was forced to make a sea landing a few kilometres short of Dover on July 19 after his engine died. Mr Bleriot, an inventor, aviator and engineer, had caught the world's attention after managing to fly 26 miles over land on July 4. On Saturday, July 25, the French aviator, wearing a full-body aviator suit, goggles and hat, strapped himself into his 25-horse monoplane, setting off at 4.41 a.m. from Les Baraques - which was renamed Bleriot-Plage in 1936. He touched down in a field below Dover Castle at 5.18 a.m., covering the 43 kilometres at an average speed of 65 kilometres per hour. "England is no longer an island," ran the Daily Mail's headline the following morning, while Bleriot was given a hero's welcome by a crowd of 100,000 in Paris two days later. Mr Bleriot's Channel feat sparked a craze for his monoplane aircraft. He went on to produce hundreds of the planes, and was later involved in producing French fighter aircraft during World War I. He remained active in the aviation industry until his death in Paris in 1936, aged 64. His original Bleriot XI, bought by French newspaper Le Matin in 1909, is on display at the Paris Museum of Arts and Crafts.